Anyone following the news the past week knows that Florence was a devastating hurricane in North Carolina (NC), South Carolina (SC), and Virginia (VA), with at least 37 deaths so far. 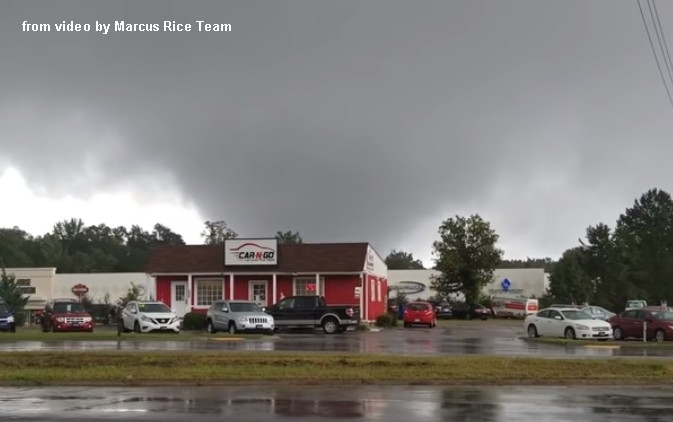 The Carolinas deaths were mainly flood-related due to Florence's slow movement and deluge of rain, and with such a large and wet tropical system, tornadoes were probably the least of most people's worries. 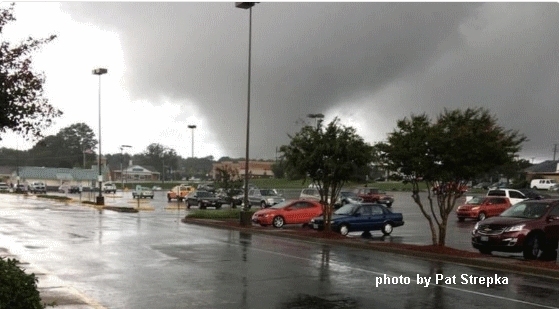 But tornadoes did occur, particularly on Monday the 17th when one person died in a tornado that hit the Richmond, Virginia area (see above). There were around 100 tornado warnings issued during Florence and her remnant's slow journey inland from Thursday 9/13/18 through Monday 9/17/18. Yet the 17th turned out to be the only truly significant tornado day of Florence's 5-day assault on the mid-Atlantic states. After my last post about tornadoes from the remnants of Gordon on September 8, I thought it would be interesting to look at possible reasons why the strongest and longest track tornadoes were on the 17th, several days after Florence's landfall. 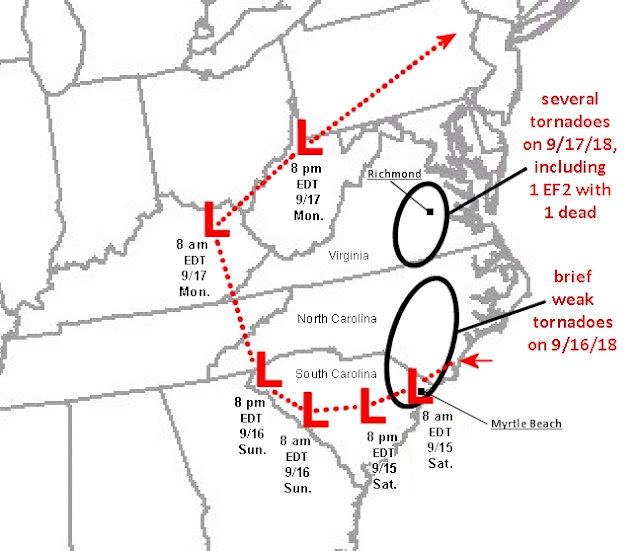 A few reports of brief weak tornadoes began coming in on the evening of the 15th near Wilmington NC, but the most tornadoes associated with Florence occurred on the 16th (brief and weak), and on the 17th (stronger and longer-lived), as indicated on the graphic above. 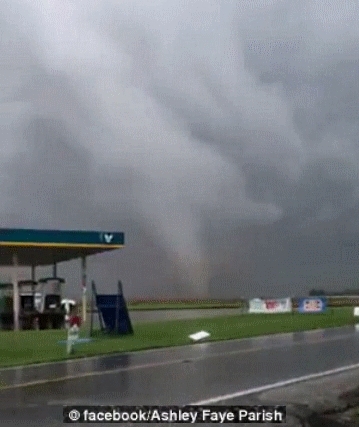 But again, why was Monday the 17th the most prolific tornado day? First, from classic research on hurricane tornadoes, such as McCaul's August 1991 paper, the strongest and most numerous tornadoes with tropical systems are most likely in their right front quadrant (looking downwind along the direction of movement). More recent studies, such as Verbout et al. (2006) also suggest that tropical systems recurving to the northeast inland over the eastern U.S. are more likely to produce tornadoes. From our tracking chart earlier, notice that Florence's center by daytime on the 17th was moving faster and actually curving back to the northeast, a result of it merging with the westerly flow aloft and the 500mb trough. 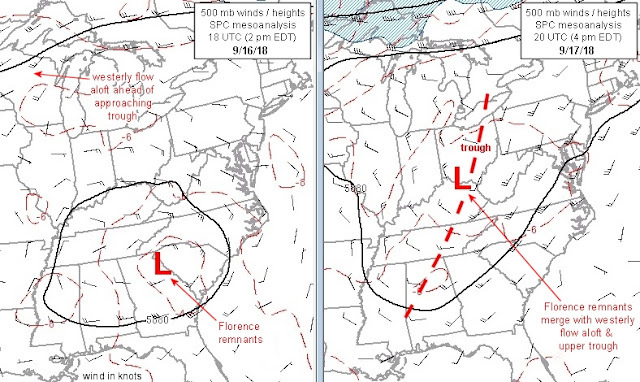 Even though Florence's remnants were more spread out at this point, this change in movement and direction still put Virginia in the right front quadrant of the remaining tropical system center on Monday the 17th, a favored location for tornadoes from the research noted earlier. It is notable that the Virginia tornadoes occurred during the period of Florence's remnants recurving northeastward on the 17th. Note that EEHI values most supportive of supercell tornadoes remained largely over water on the 16th. 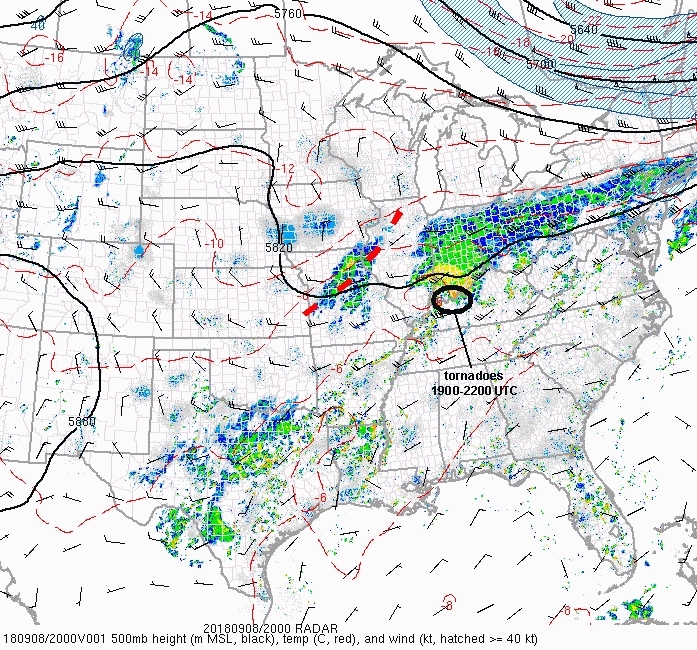 But, on the afternoon of the 17th, large EEHI values came together inland over Virginia where thunderstorms were occurring with the spread out remnants of Florence as the remaining circulation center over West Virginia now moved northeastward. 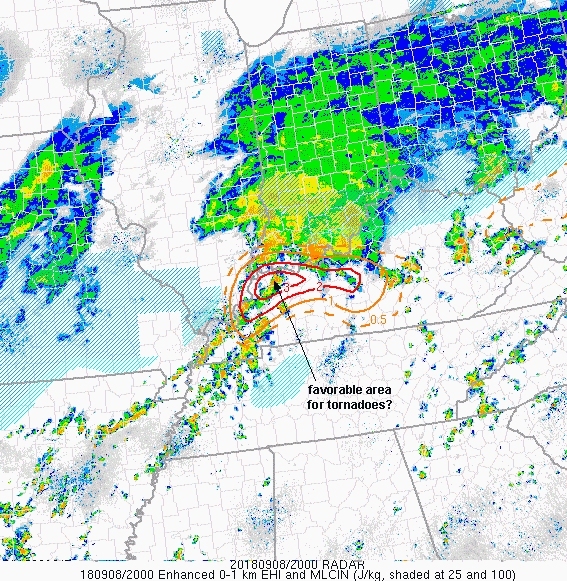 Stronger deep-layer shear helps strengthen and organize convective updrafts, and can help to support tornadoes when combinations of low-level shear and instability are also in place. 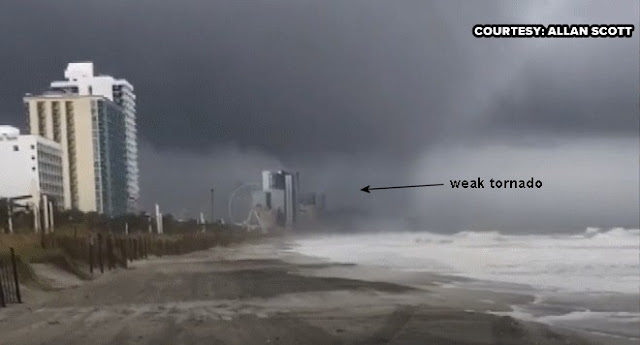 Distinguishing tropical systems that produce stronger or more numerous tornadoes from those that don't produce tornadoes or are associated with brief weak tornadoes is difficult and certainly not that well understood. 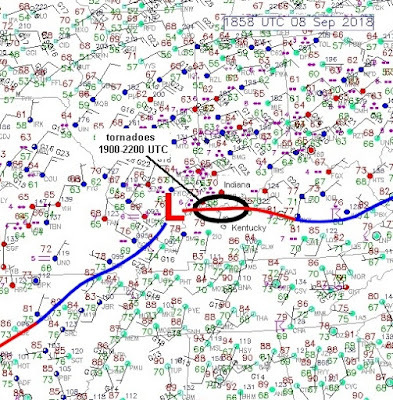 But some of the factors discussed above can be helpful at times in forecasting such tornadoes. If you can, please donate to a charitable organization to help with recovery from Hurricane Florence. It's the middle of hurricane season, with dangerous hurricane Florence bearing down on the Carolinas later this week. Hurricanes and tropical systems can produce tornadoes, particularly in their right front quadrant. So, I thought it would be interesting to look back at last week's much weaker tropical system (Gordon) that produced some tornadoes (see above) in Kentucky and Indiana on Saturday, September 8. 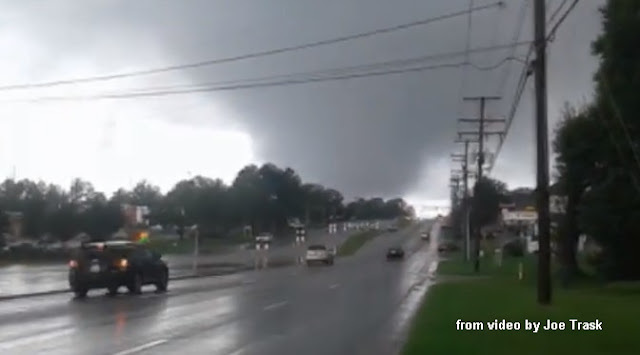 This included one tornado of EF1 intensity at Stanley KY, just west of Owensboro, shown at the top of this post. Why would Gordon suddenly start producing tornadoes again four days after landfall? This graphic also shows deep-layer wind shear (surface to 6 km above ground, in blue lines) on September 4th, 6th, and 8th. Notice how the shear weakened and essentially disappeared as Gordon's remnants moved farther inland on the 6th and 7th. 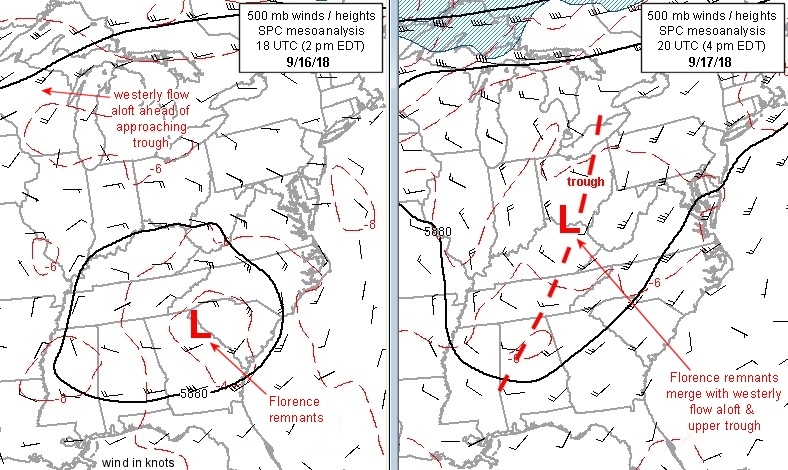 But by Saturday the 8th, when encountering energy from the midlevel disturbance, the wind shear dramatically increased near Gordon's remnants over the Ohio Valley. 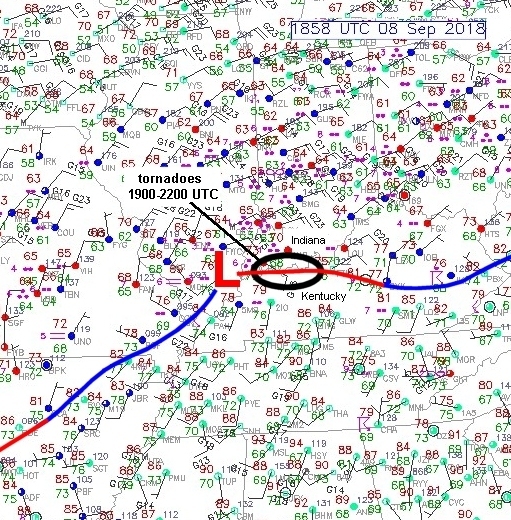 This is what helped to produce the tornadoes, because supercell tornadoes, along with an unstable environment, typically require sizable wind shear (a change in wind direction and increase in wind speed with height) to develop. Hurricane Florence (category 4 as I write this) poses a much bigger threat than Gordon's localized tornadoes when it hits the Carolinas on September 13 and 14. Wind driven storm surge, heavy rain, and flooding will likely be huge and potentially life-threatening issues, and I'm just hoping it won't be as bad as most forecasters are thinking.